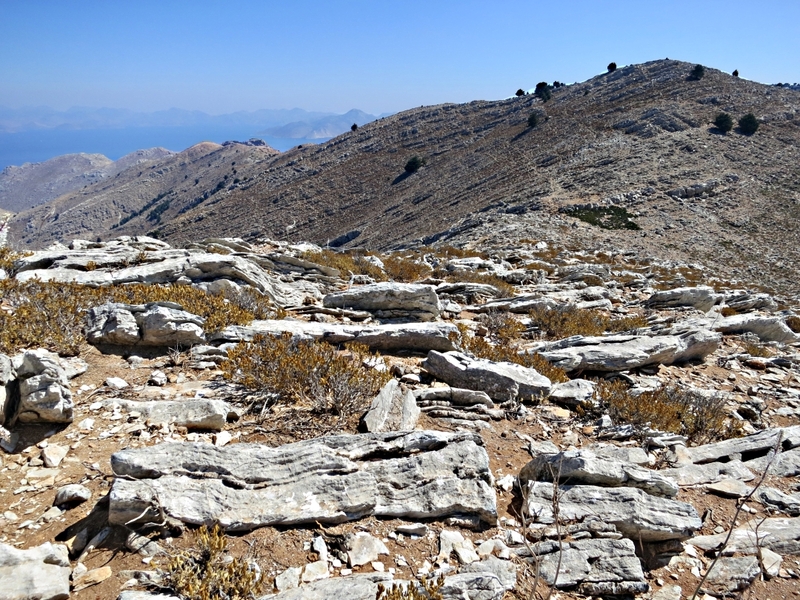 The top of Vigla, the highest mountain on Symi, is always a little disappointing. There is a whole array of telecommunication masts on the adjoining peak, with a road for their construction and maintenance bulldozed on the south side. A new wind turbine is within spitting distance of the trig point. After 4 years it continues to be non-functioning, two blades sticking out horizontally like arms on a skinny, headless scarecrow. I’m told it’s of German manufacture and there is reluctance to provide a replacement for the faulty component until the bill is paid. There is solitude but no sense of isolation on top of this mountain. The satisfaction is in getting there the hard way, straight up the north scarp from Horio, the old village above the harbour. There is no path beyond the monastery at its foot and even the path to there is in a poor state since a road access was pushed in from the tarmac at a higher level. My preferred route is to climb a long rib of rock rising steeply from the monastery, more exposed though more reliable and secure, but closer to the top an upward diagonal traverse on very loose material is necessary before getting back onto rock outcrops. 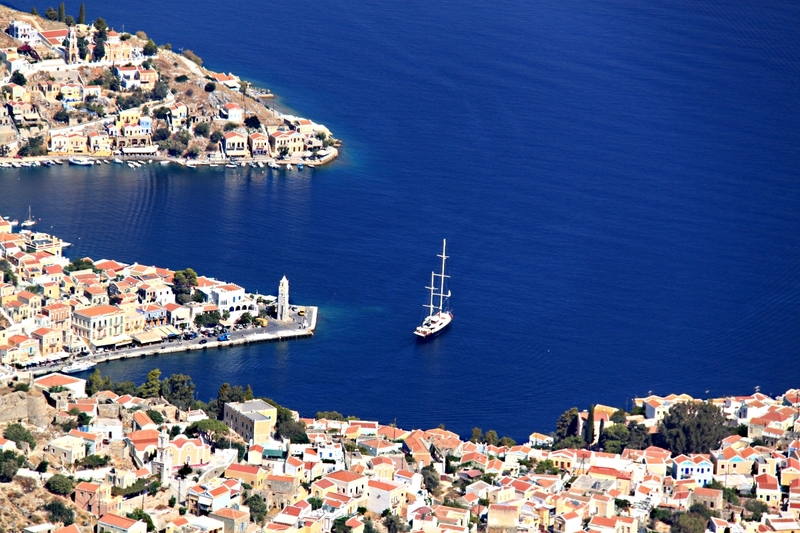 Like the rest of Symi the rock is limestone, in places sharp as razors, elsewhere smooth and tilted, near-vertical slabs. On lose ground thin shards, hard as steel, slide over one another, clinking metallically when they flip over. It is clear that this is terrain little visited. 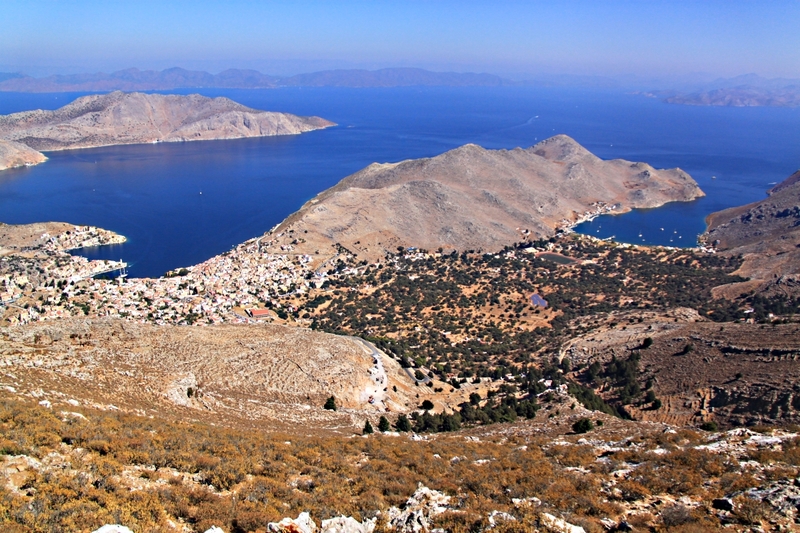 Few Greeks walk/hike/trek anyway. 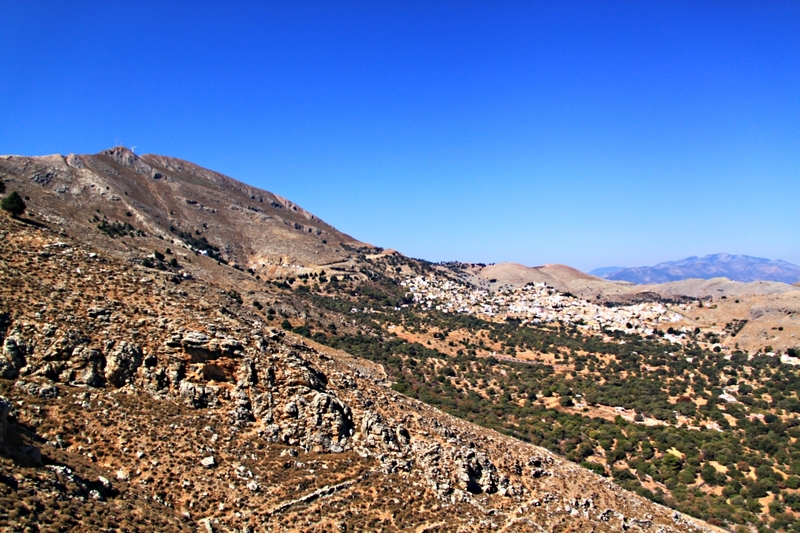 The local sheep farmers and goat-herds tend to call their animals not chase around the mountain after them. 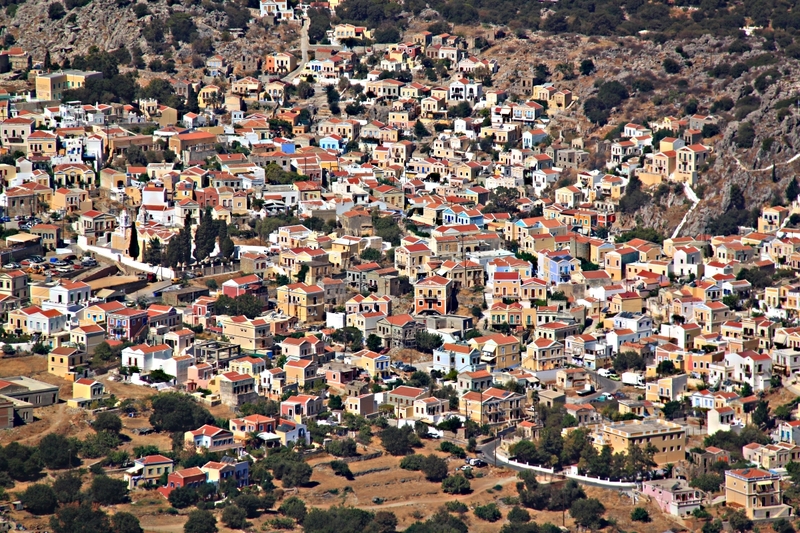 The number of visitors who venture into the mountains is diminishing and almost exclusively tend to follow well trodden paths to well known beach destinations, principally Agios Vasilios, Agios Emilianos, Agios Nikolaos, and Agia Marina. After 15 September, the start of the hunting season, shooters roam the mountains in pursuit of their quarry, rock partridges. Usually well camouflaged, the only indications where they have been are empty shotgun cartridges scattered around. 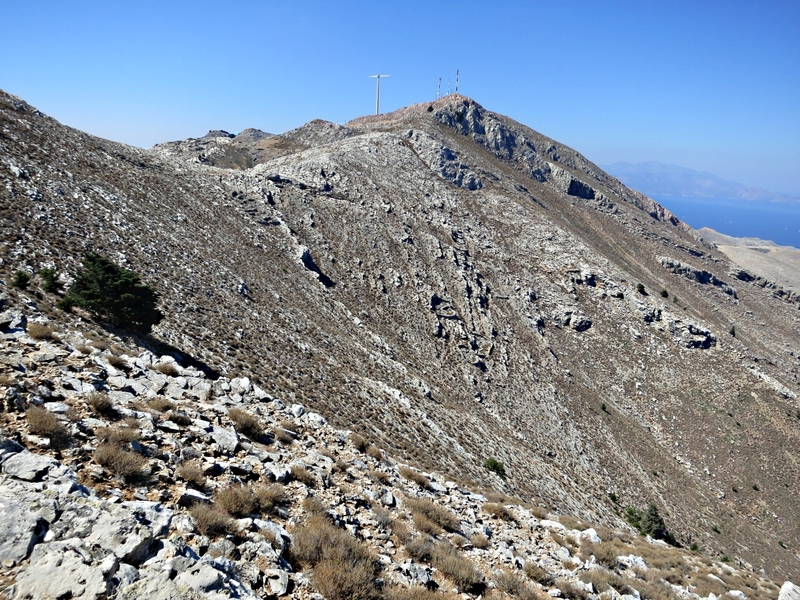 I saw none on Vigla’s northern scarp. That means that even the hunters don’t come here so little prospect of being found in the event of an accident. More than usual care is therefore essential. 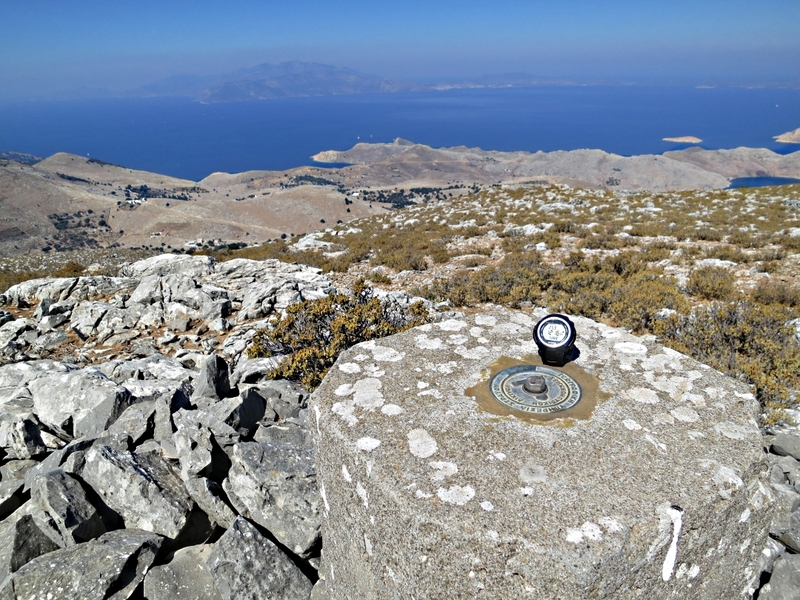 Nevertheless I make good time and reach the modest 617 metre summit in less than 2 hours. Ignore the masts and the wind turbine and in late summer sunshine from cloudless sky with a gentle breeze it’s a great place to be with views to the south of mountain-top monasteries such as Agios Stavros Polemou, to the east beyond the edge of Europe to the coast of Asia Minor, to the west the islands of Tilos and Nisyros, …. and the island’s landfill site. Eventually I reluctantly leave my eyrie and set out to walk northeast to the end of the ridge, again with no footpath. 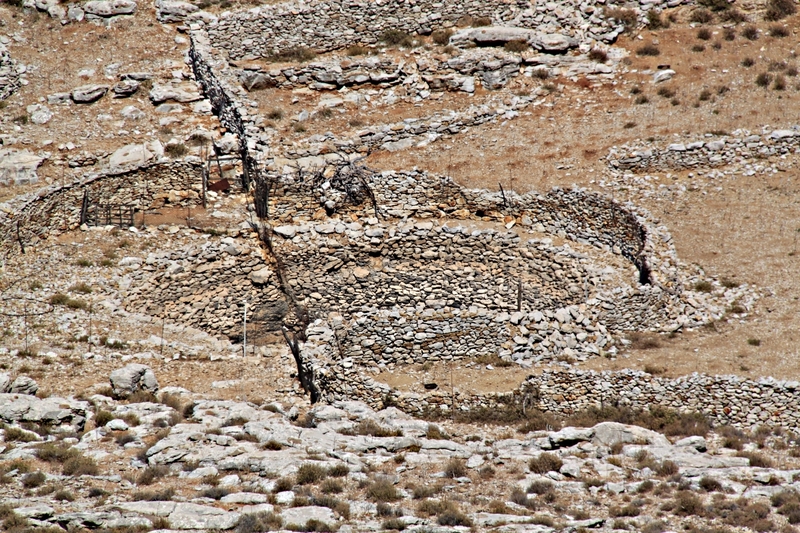 Having dropped down sharp limestone rocks from the top to long-abandoned agricultural terraces on the narrow ridge, initially the route is across inclined slabs of rock, jumping from edge to edge, heading for a thin path made by goats migrating from one part of the mountain to another. 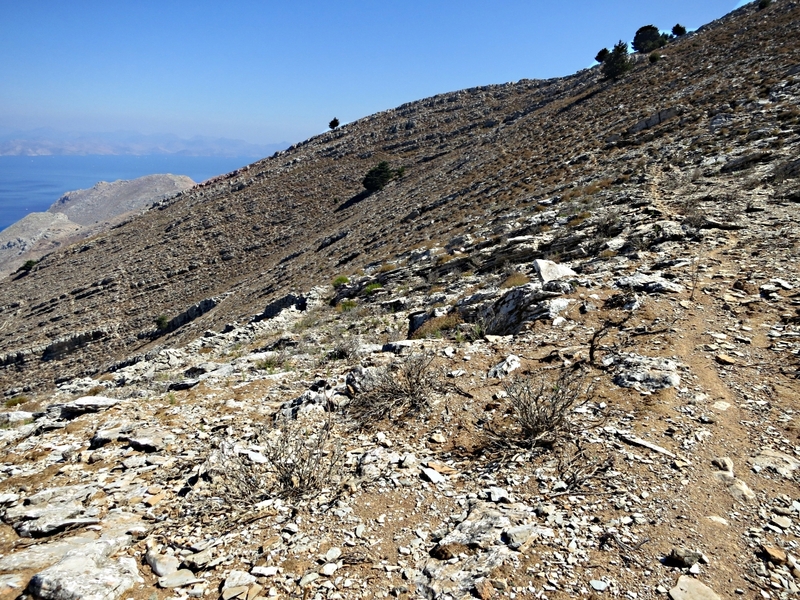 The goat path is at first very clear, a narrow line of dusty soil meandering through the oregano, sage and thyme, then hoof-polished rock picking the line of least resistance up craggy outcrops. As goat paths go this is well worn, the equivalent of a major trunk road, probably travelled over centuries. However when it comes to open, lose ground it disappears as the animals disperse before coming back together and the path resumes. My guess is that the kids learn the routes from the adults, much like hefted sheep in the Lake District, but I don’t have that advantage and need to cast around to find the route again. Easy to see and follow when on the line, it is all but invisible from above or below, hidden in the vegetation. 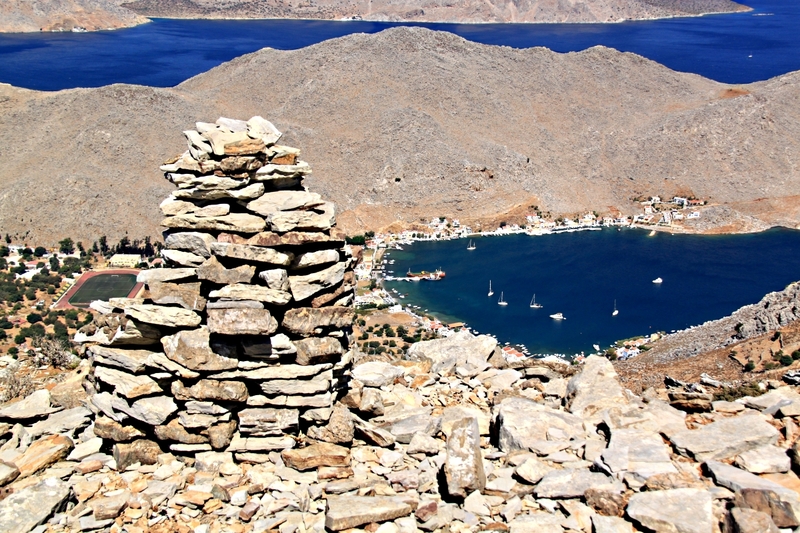 An hour and a half after leaving Vigla I’m standing on a smaller 440 metre peak at the far end of the ridge marked by the remains of stone buildings and a stone cairn 1½ metres high overlooking the abandoned village of Gria and below that Pedi Bay, Symi’s other major anchorage. First a steep drop down to Gria with its derelict houses, fig trees from which we picked figs 10 years ago but now crumbling to dust, and its stone-lined pond still with water in even after the long summer drought. 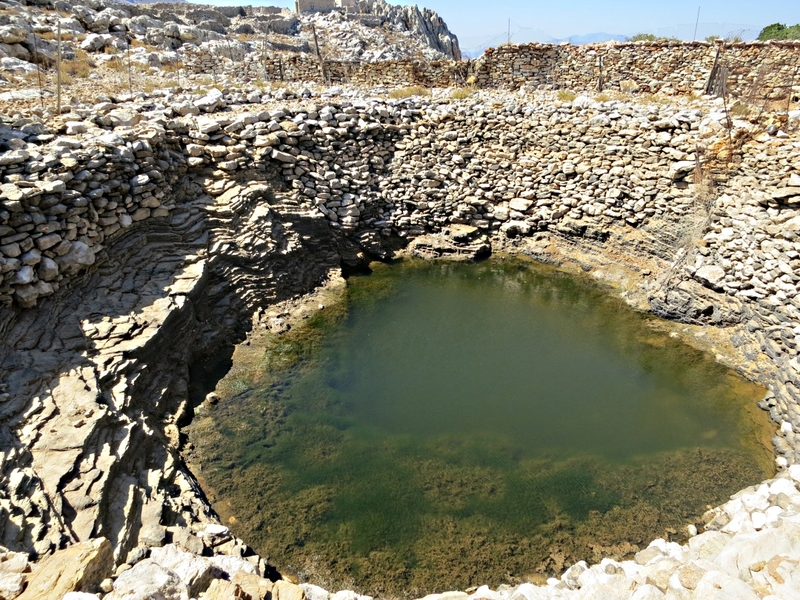 The final 200 metre drop to sea level is down the rocks of a dry stream gulley, airless and very hot from direct sun and reflected and refracted heat from the storage-heater limestone. 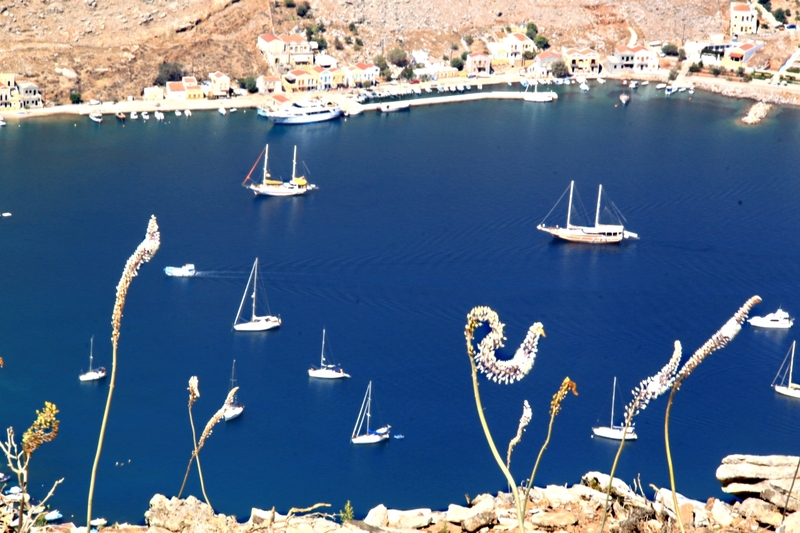 Then a swim in the gorgeous waters of the Aegean to soak tired muscles before the gentle stroll up the valley path back to Horio and a very welcome beer. 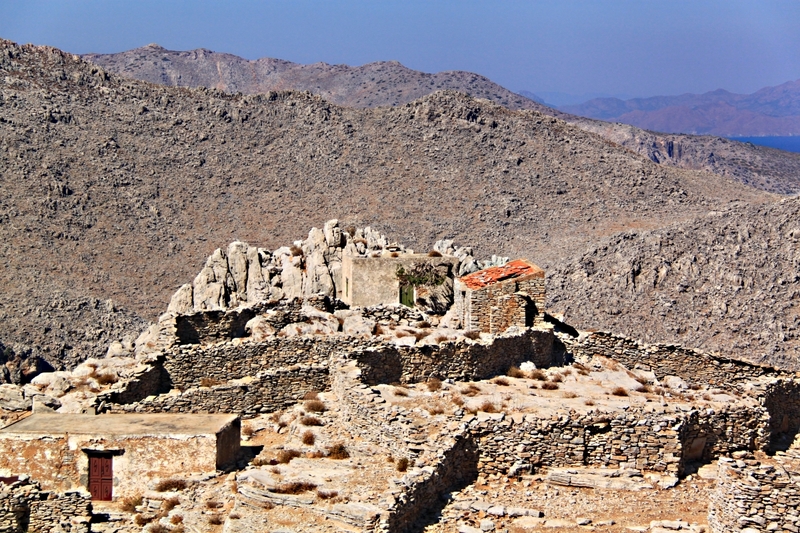 This entry was posted in Greece, Hiking, Landscape, Mountains and tagged abandoned village, Aegean Sea, crags, goat paths, Greece, hiking, limestone crags, off-piste, Pedi Bay, rocks, rocky gullies, swimming, Symi, Symi harbour, treks, Vigla. Bookmark the permalink.